When a customer makes the checkout on your store, it is required to type in a CVV number. This function provides extra security of customers’ payment data and prevents possible fraudulent activity. The Payfort platform provides an additional security layer via 3D secure verification. This way, merchants can verify a customer identity by redirecting shoppers to the page where they need to insert an OTP sent via mobile phone before making a payment. iFrame used by the Magento 2 extension allows processing customers’ data on the Payfort server without storing sensitive information on a merchant’s server. 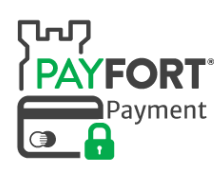 With the payment tokenization provided by the Payfort gateway, customers’ credit card data is highly protected from any frauds. The module supports multiple credit card types so that online shoppers can choose the most suitable option at the checkout. Magento admins define the available credit card types in the backend. When entering credit card details, a customer can save them for future usage. Thus, next purchases can be made faster since the need to provide payment data every time a customer shops on an online store is eliminated. Customers get access to all saved credit cards in a dedicated tab in their account area, where they can manage their cards. 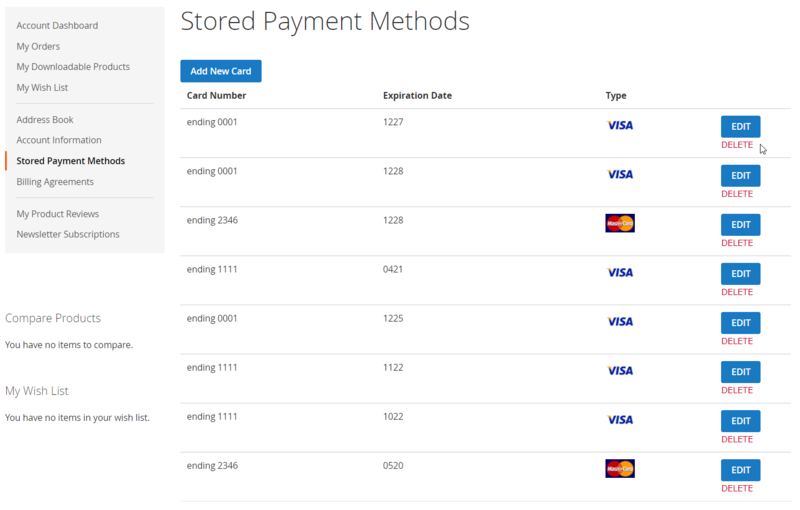 The Stored Payment Methods tab allows editing and deleting existing cards and add new ones. With the Payfort Payment Gateway extension, admin users can create partial invoices for the items purchased using the Payfort method. 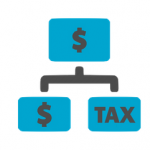 Thus, store owners get the possibility to split an order by generating multiple invoices per order. Furthermore, the Magento 2 module supports online credit memos for partial refunds. Another opportunity provided by Payfort Payment Gateway for Magento 2 is placing orders on behalf of customers from the Magento Admin. This way, store owners can create orders on a customer request. 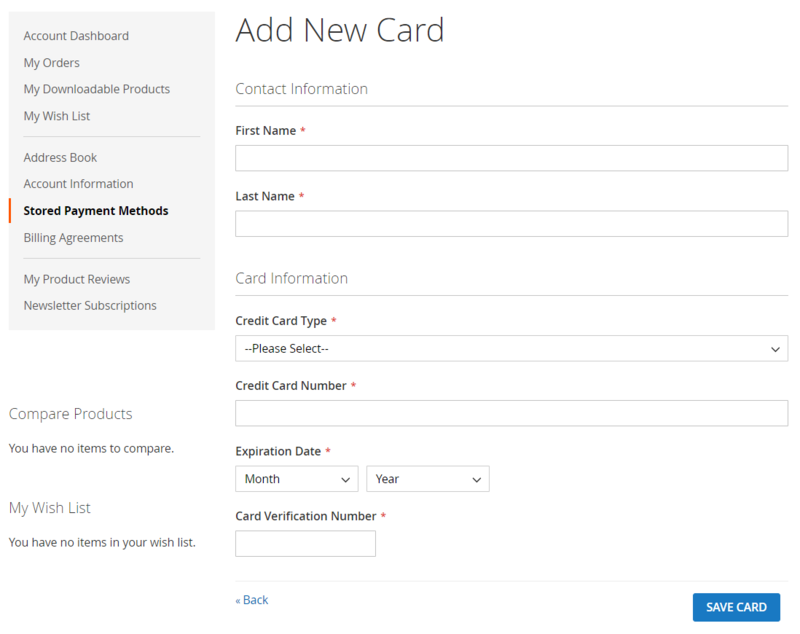 When admins place orders in the backend, they can use customers’ saved cards, as well as add and save a new card. For increased security of credit card data, admins are required to enter a CVV code to place an order. Since the Magento Payfort payment extension is fully PCI compliant, it doesn’t store any sensitive data on a merchant’s server and helps prevent fraud risks. To start using Payfort payment gateway on your web store, first, enable it on the Configuration page. Then, activate the vault functionality to allow customers to store their credit cards data on the Payfort server and create a title for the Payfort payment method. In the Merchant Identifier and Access Code, insert the credentials from your Payfort merchant account. Values in Hash Algorithm, Request SHA phrase, and Response SHA phase should be equal in both Magento and Payfort merchant configuration. By Selecting Yes in the Test Mode setting, you can check how the extension works in the development environment. Next, select a payment action (Authorize or Authorize and Capture), enable/disable debug mode, choose a new order status (Processing or Suspected Fraud), and specify the sort order. 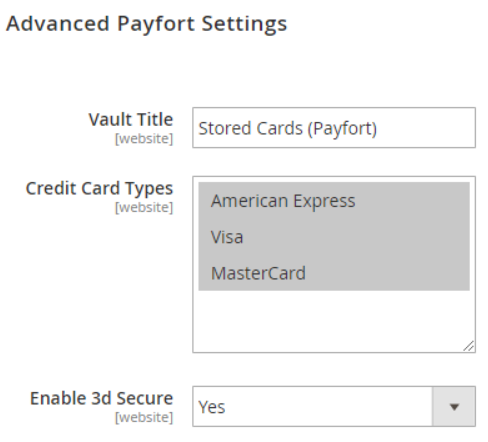 In the next section of the Magento 2 Payfort payment module’s general settings – Advanced Payfort Settings, specify the name of the vault that will be displayed on your storefront, select supported credit card types, and enable 3D secure for additional security layer. In Country Specific Settings, you decide from which countries to allow accepting payments on your website: any country or specified ones. 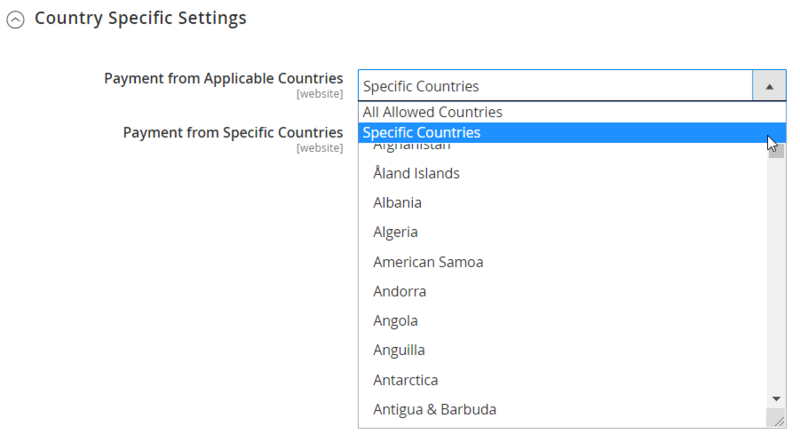 If you choose Specific Countries, select particular countries. 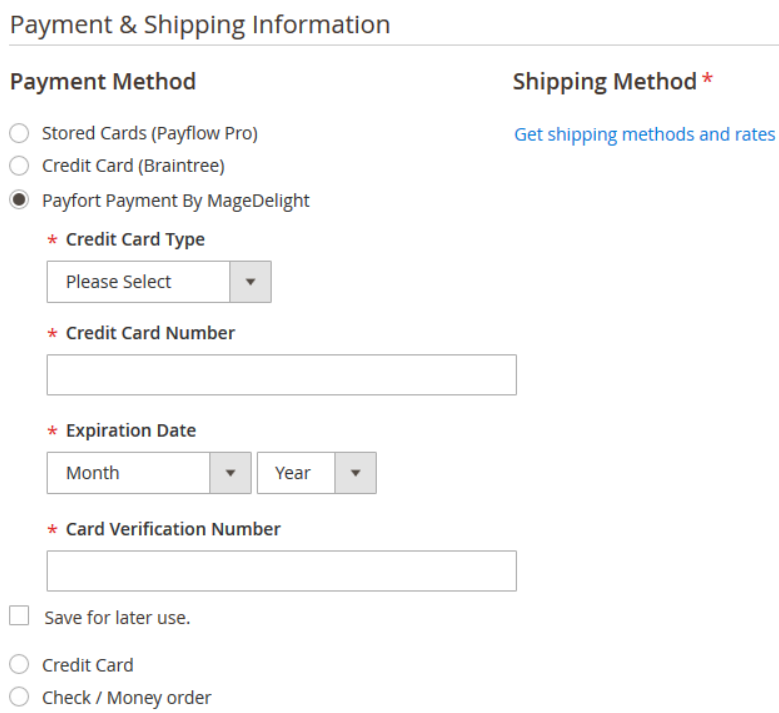 As we’ve already mentioned above, Magento 2 Payfort Payment Gateway by Magedelight allows store admins to check which payment method was used in the order. To view payment details, select an order from the Orders grid and scroll down to the Payment & Shipping Method section of the Information tab on the Order View page. Besides, admins can place new orders on behalf of a customer using saved cards or adding new ones and saving them. 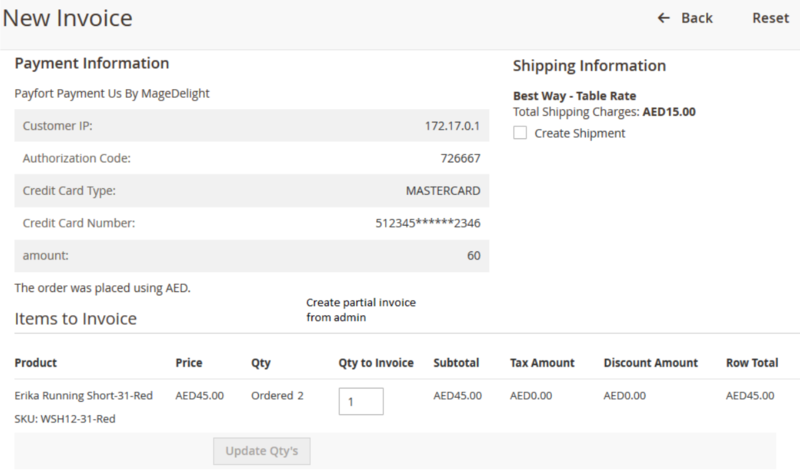 As for partial invoices for the products paid using the Payfort method, you can also create them from the Magento Admin. 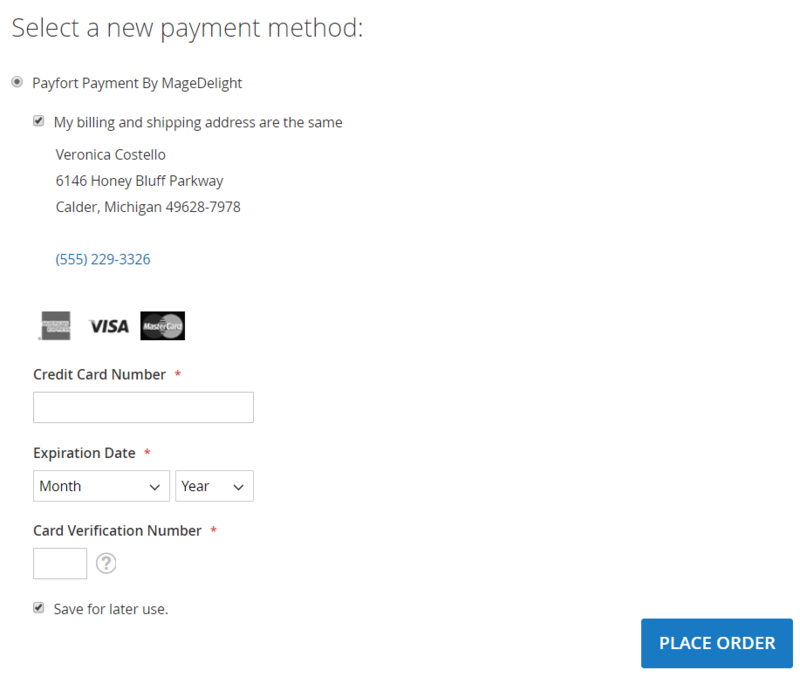 The Magedelight Payfort Payment Gateway extension for Magento 2 provides an additional payment option on the checkout page. After typing in credit card details, a customer can save his or her card for future purchases on your online shop. The module adds a new tab to the My Account area – Stored Payment Methods. Here, registered customers can view their cards information, edit and delete saved cards, as well as add new ones. Below, you can see a new card form. 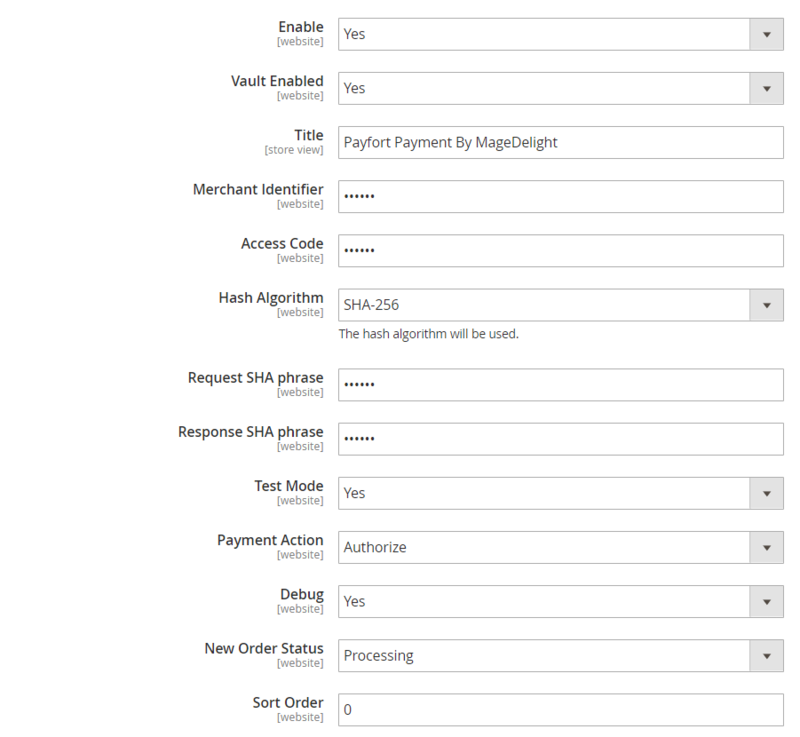 Magedelight Payfort Payment Gateway for Magento 2 provides merchants with a platform enabling them to accept and process online payments securely and efficiently. By installing the extension, you provide your clients with safer and faster payment transactions, which increases trust to your business and improves the shopping experience. The price of the Magento 2 module is just $149, so don’t hesitate to give it a try.